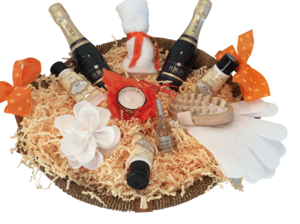 The Champagne and Gift Company is the ultimate destination for unique gift hampers and each hamper can be personalised with your own special label – Bath & beauty hampers, themed hampers, classic hampers, chocolate hampers and lots more …. delightful, delicious, unique & handcrafted. Filled with specially chosen luxuries they make perfect gifts for and occasion. Every one of our boxed gift hampers and gift boxes is full of delicious treats and delightful things. Choose from Chocolate, Champagne, Prosecco and many other delicious hampers. Filled with nothing but life's essential luxuries, our luxury hampers are made for entire families, colleagues and loved ones. All our hampers are beautifully presented and protectively packaged. We offer next day delivery throughout the UK. International deliveries take a little longer!